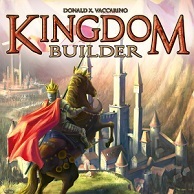 Kingdom Builder is a strategic construction board game designed by Donald X. Vaccarino and released by Queen Games in 2011. The original board game received the 2012 Spiel des Jahres (Game of the Year) award at the prestigious annual Spiel game fair in Essen, Germany as well as winning several other accolades from the hobbyist board gaming community. 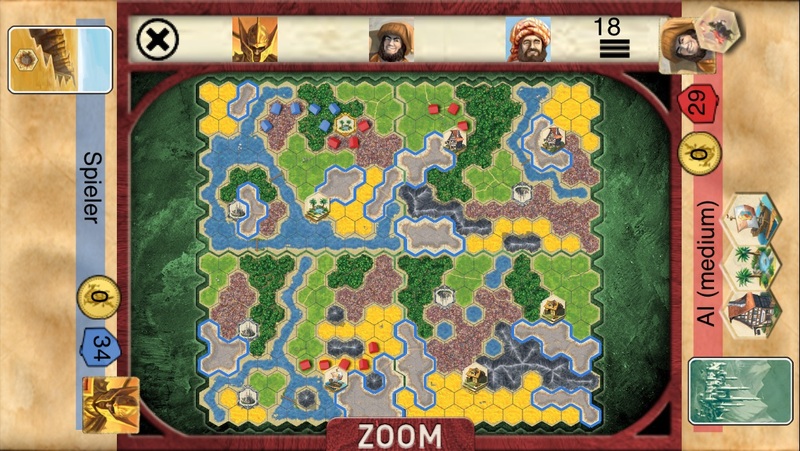 A game of Kingdom Builder begins by dynamically building the game board from a random selection of four of the eight available board sections composed of 100 terrain hexagons each. The game is scored by earning gold for building on to and adjacent to particular terrain types. After the game board if laid out, three Kingdom Builder cards are drawn at random from the selection of the ten that are available. These Kingdom builder cards define the rules for scoring in the forthcoming game session to be played. On a typical turn a player will put three settlement tokens on an unoccupied terrain hex of the terrain type drawn at the end of the previous turn. The player may then pick up a location tile if they have built next to a location that has not had its tiles already claimed. Location tiles picked up on previous turns can be used to perform and extra action such as placing an additional settlement or moving an existing one. Players continue taking turns competing for the ideal building areas that stand to score the most according to the rules established by the three Kingdom Builder cards drawn at the beginning of the game. The game ends when any of the players has placed his last settlement token, at which time the "gold" earned for each players settlements is tabulated an the winner of the game is determined. The digital adaptation of Kingdom Builder has a decent interface and leverages the advantages of the digital format by highlighting the legal locations a player may build during their turn, making it easier for new players to pick up the game. One caveat mentioned by reviewers is the absence of an undo button, so players must very carefully place their settlements, making use of the zoom function to avoid accidental placements. Also included is an in-app rule book and interactive tutorial to help people new to Kingdom Builder learn the basics of playing the game.